Summary: The Honorary Scripting Guys for 2014 are announced. Here is a little more information about the new Honorary Scripting Guys. If you click the link on their names, it will take you to their Hey, Scripting Guy! Blog posts. Ashley is a premier field engineer (PFE) for Microsoft. He started writing code on a Commodore VIC20 in 1982, and he has been hooked ever since. Today he specializes in Active Directory and Windows PowerShell, and he helps Microsoft Premier Customers reach their full potential through risk assessments and workshops. Ashley’s favorite workshop to teach is Windows PowerShell Essentials, and his TechNet blog focuses on real-world solutions for Active Directory by using Windows PowerShell. Gary is a senior premier field engineer for Microsoft, specializing in everything PowerShell. These days, he teaches several Windows PowerShell classes to Microsoft customers. Check out Microsoft Premier Support Services to learn more. 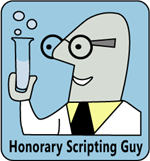 Ed also gave me a list of previous Honorary Scripting Guy recipients who have made a significant contribution to the Hey, Scripting Guy! Blog in 2014. If they were not already Honorary Scripting Guys, they would be! Thanks to all the guest bloggers.